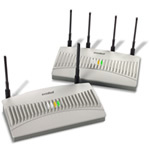 Barcode Datalink recommends the Motorola range of wireless access points. However, if you have Belkin, D-Link, Netgear or any other brand of access point so long as you can get your mobile computer connecting to the wireless LAN and ultimately connect to the internet, it should be ok.
Before using Stocktakes Online (STO) you should test the coverage of your wireless LAN and make sure your mobile device stays connected in all areas that you want your staff to count stock. If you have a much larger area to cover or several adjoining warehouse buildings then we would recommend considering the Motorola Wireless Switch WS-2000.